Do you hate money? Do you have an itch that can only be scratched by stamped receiver, roller delayed blowback German transferable machine guns? Then you might want to take a look at EuroOptic.com’s H&K 94/MP5K with S&H Auto Sears package. 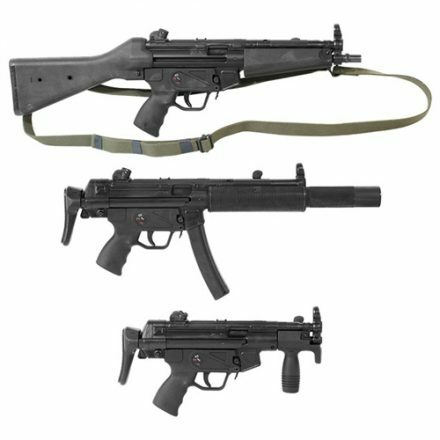 Converted by S&H Arms MFC Co. of Owasso, OK, this package consists of three fully-transferable Class III MP5 rifles, with consecutive serial numbers. The three conversions consist of a fixed stock MP5 with a 3-lug barrel attachment, an MP5 SD with retractable stock, and an MP5k with retractable stock and vertical grip. All three feature the West German trigger group and paddle magazine release, and come with the original paperwork and S&H’s conversion manuals. The price? A paltry $150,000.00. And, hey; free CONUS shipping!